Davy is a STOTT PILATES and GYROTONIC® trained instructor, who loves to challenge her clients and help them feel great in their bodies. 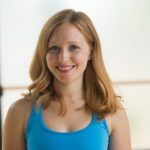 She believes that we all have the power to heal our bodies through movement. Davy is Certified in STOTT Pilates Mat & Reformer work, Prenatal & Postnatal Pilates, Pilates for Diastasis Recti and is a GYROTONIC® Apprentice Trainer. Davy’s love of movement began at a young age when she first discovered gymnastics. Through her school years she was a competitive gymnast and gymnastics coach. During college Davy studied International Affairs at Ohio University and post college pursued development work as a Peace Corps Volunteer in Zambia. She is passionate about health prevention and education, women’s health, and holding space for healing to occur. Davy works with clients of all ages and populations, including: post-rehab pilates, prenatal and postnatal pilates, chronic illness, cancer survivors, elder adults, athletes, runners, joint replacement, and anyone who has ever sat at a desk.